Technology is a tool which can be used for good and for bad. How do we know which it will be? How do we know what the consequences will be when we build a gadget, an app or a web platform? And, perhaps more importantly, what the unintended consequences will be? Today the most powerful organisations are created by young people. Facebook, Google, Youtube etc influence our lives far more than GM, GE etc influenced past generations. These new organisations go straight into your mind; they’re with you 24/7. Past generations could park their Chevy in the street and turn off their TV, but we can no longer do this. We slowly merge with the phones, watches, glasses, clothes and other products and services around us. This is one of the reasons why we need wisdom in the creation process of new companies. We need wise people in the start-up ecosystems. Today, power is slowly transformed from institutions to start-ups. We cannot tell these companies what to do but we can inspire them. A start-up which was formed 50 years ago could reach global impact within a couple of decades. A start-up founded five years ago could reach global impact in a couple of years. A start-up which will form in ten years might consequently have global impact within seconds. How can we make sure that these start-ups and their innovations are wise? Unless we get in there: Into the start-up scene and the start-up ecosystems around us. So if you want to have a say in your future; start our own companies, work with entrepreneurs and visionaries. I like science and technology. But to me that is only one part of the future. I think we must reclaim the future from the science and technology futurists. There are other futures. A couple of years ago I included this image in the research proposal for my Masters thesis. It shows roughly how organisational innovation has changed from being the task of one “lone genius” (à la Thomas Edison) to today’s models, where the world is invited to be on your R&D team. Are the products and services, being born in today’s collaborative, creative initiatives wiser because there were more people involved in the innovation process? In the end I left this initial research question to something more feasible, but the question still fascinates me. Another thing that intrigues me with this graph is the question; “What Next?“. 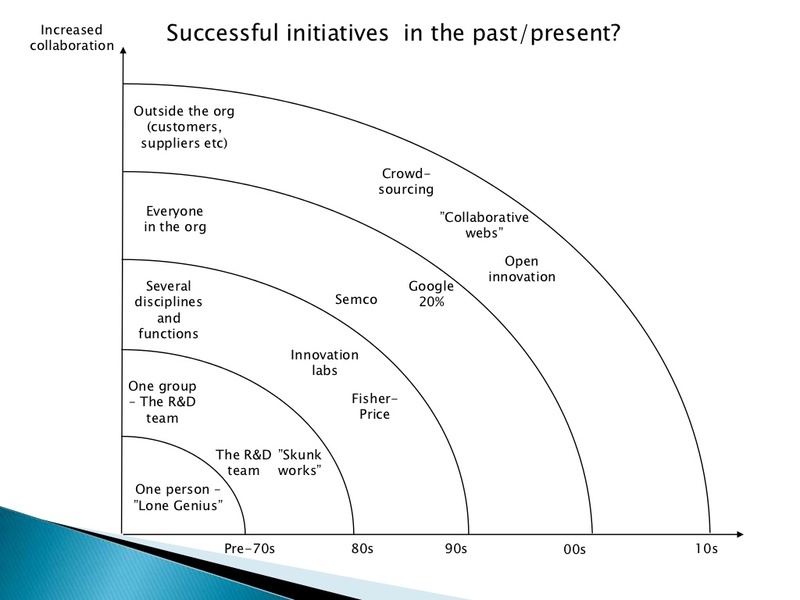 What comes after open innovation, crowdsourcing and collaborative webs? I suggest that we add another, third dimension; a z-axis. And I hope that we collectively decide to put wisdom on this axis. We’re heading into a world of fast, distributed networks rather than slow, centralized and ‘controlled’ institutions. This is good but of course also dangerous. I think my issue with institutions is that it’s a technology which is increasingly obsolete and therefore is being disrupted (often without orgs knowing it themselves…). Check out the talk by Martina Gorbis from IFTF, where she argues that institutions no longer make economic sense, why they will increasingly be replaced with something else. Adam……the video you post is of a leader of an ‘Institute’! Are thriving modern companies like Apple & Google not institutions? Is diversity of organisations preferable to a homogenous landscape of small start ups? Older Institutions are being disrupted, but many of them are adapting rapidly….local examples are CSIRO, RMIT, ABC. I believe we need organisations such as these where particular talent and skills are concentrated and the culture is such that there is collective agreement on outcomes, values and future direction. Such structures ensure that time & energy are not wasted on repeated attempts at ‘reinventing wheels’. It is a case, I believe, of the whole being greater than the sum of it’s parts. True. There are institutions and institutes which are great, and I would love to see them adapt to the new world. I have trouble imagining hospitals, for instance, being run on flexible, fast start-up principles. I too believe we need organisations like the ones you mentioned. The challenge for these, which Martina Gorbis point out in her aforementioned talk, is that soon, it will no longer make financial sense to organise people in organisations or institutions. And since the invisible hand of the market directs our societies, these will likely disappear. This “technology” will disappear and be replaced with something else. My bet is on networks. Then of course we can choose to stop believing in the invisible hand as well and start to value other things in communities and organisations. But for now that’s not why institutions exist, no matter what they were in the past, or what their leaders tell us.